caregivers, children and professional friends to our Winter Holiday Family Event on Friday, November 30. Children were treated to supervised winter crafts and activities, while adults learned how to create a stress-less holiday season from Ms. Sally Masri, Mindfulness Instructor. Sally then helped our children create sparkly calming tools to use to manage their own stressful feelings. FFF took a moment to honor and thank outgoing Board Chair Dee Robinson Rutkowski. Dee has served the organization and our families faithfully for over 6 years. We appreciate all Dee's service, support and committment to formed families! The evening wrapped with a very special visit from Santa and Mrs. Claus (who bears a great resemblance to Dee Robinson Rutkowski!). Children of all ages enjoyed meeting the Clauses and sharing their holiday wishes. Thanks to all the families who joined us for Winter Holiday Family Night; it was a joyous way to kick off the season! Formed Families Forward wishes you and yours a joyous and peaceful holiday season. Winter offers wonderful and restive opportunities to connect and reconnect with friends and family. FFF is pleased and honored to continue and grow our work with foster, adoptive and kinship families and professionals. participate in our ongoing free Tuesday evening ongoing Stronger Together peer support groups. Twice monthly, two groups- one for parents and caregivers and another for youth and young adults age 14-22- meet to offer and receive peer support. Both groups are led by licensed clinicians and we provide a light dinner for all. The groups are free to attend but please REGISTER! Another winter opportunity is our LifeSkills Training for middle school students evening classes. This winter, FFF is providing the 6-session course on Thursdays from 5:30 - 7 PM at the Sherwood Community Center, in partnership with the Fairfax City Parks and Recreation department. The class starts January 10 and a pizza dinner is served each week. Tweens and teens work with our young adult facilitators to learn social skills, drug- and alcohol-refusal skills, choice-making and much more. REGISTER HERE through Fairfax City. Sessions are free and students who attend regularly can earn gift cards! Finally, as the year comes to a close, please consider helping Formed Families Forward continue to support foster, adoptive and kinship families improve outcomes for the children and youth in their care. Donations of time and treasure can be made HERE. Q: I keep hearing about this new Family First Act and how that will change the way foster care operates. What's that about? A: The Family First Prevention Services Act (Family First) became federal law on February 9, 2018. Family First is a landmark child welfare law reforms major federal child welfare financing streams to provide services to families who are at risk of entering the child welfare system. The bill allows funds to be spent to prevent children from entering foster care through delivery of mental health services, substance use treatment, and in-home parenting skill training. Voices of Virginia's Children has r esources on Family First, including a webinar recording, HERE. Among other provisions, Family First opens new oppportunities for supporting kinship care by grandparents, aunts, uncles and other relatives. For the first time, this Act will allow federal child welfare dollars to be used for up to 12 months of services and programs to prevent children from entering foster care by supporting the triad of generations in grandfamilies - children, kinship caregivers and parents. Children can get services if they are at imminent risk of entering foster care and can safely remain at home with parents or with kinship caregivers. This includes children whose adoption or guardianship is at risk of disruption or dissolution. Kinship caregivers or parents of the children can also get services if they are needed to prevent the children’s entry into care. Generations United has a summary of Family First's kinship provisions HERE. December 20 - Collaborative Individualized Education Program (IEP) Meetings: Parents as Partners, hosted by Fairfax Co Public Schools Parent Resource Center, Dunn Loring. January 8- Getting Past Procrastination: How to Get Kids Organized, Focused and Motivated. ADHD Lecture Series, hosted by CHADD of No Va and DC, Vienna. January 10- Middle School LifeSkills Training starts, hosted by FFF, at Sherwood Community Center, Fairfax City. 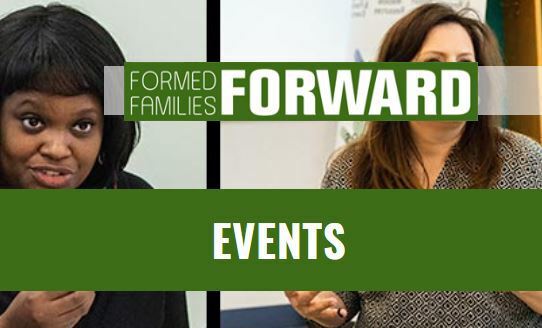 April 27- SAVE the DATE for FFF's Annual Spring Forward Family Fun Day and this year, regional professional conference, Manassas. Registration opens in January!